However, as a frugal mom, I've avoided buying pre-made frozen burritos unless I could combine a coupon and sale. As cheap as these goodies can be, making food at home is almost always cheaper — and healthier. Here are 10 posts and articles that helped me reach my own personal freezer burrito heaven. I thought these burritos would be stored and baked in a brown bag, but according to Amy's Finer Things, which also posted the recipe, they get their name from the idea that they'd be great to pack for a cold lunch. (No thanks, I'll stick to heating mine up.) I like this recipe because it looks a bit spicy, and because the paper towel/foil wraps look like a good way to avoid freezer burn. This post has great tips on how to work with the tortillas to make them wrap nicely. With two kinds of beans, rice, and other goodies, these burritos would have a nice textural variety with low-cost ingredients. Personally, though, I would not add the greek yogurt/hot sauce into the burrito before freezing, because I don't think that would taste good when the burritos are heated. It would make a great dipping sauce, though. I like the spices used in these two recipes to keep things from getting boring: Super Bean Burritos and Freezer Beef and Bean. These posts have good instructions on how to freeze the burritos. First lay them on a baking sheet in the freezer, unwrapped, then remove after half an hour to wrap in plastic wrap, then store wrapped burritos in a large freezer bag. The pre-freeze is supposed to prevent the burritos from falling apart while you wrap them. This would be one of the quickest recipes to whip up, because it gets its punch from a jar of salsa and packets of taco seasoning. I like how Andrea spreads the refried beans thin all over the inside of the tortilla to glue the thing together. This post answers the nagging question that always occurs to me when I'm elbow-deep in a supposedly-money-saving project and my phone rings and one of my kids gets hurt and also I spill something hot on my toe: Is this really worth it? In the case of frozen burritos, it turns out, making at home delivers a pretty large cost savings compared to buying a nice, big, high-end frozen burrito like those sold by Amy's. The recipe looks good too, but the best part of this post is that Macheesmo does the math for us. When do you need the convenience of a freeze-and-go meal more than at breakfast time? The ingredients are what you expect — but I loved learning how to cook two dozen scrambled eggs easily in the oven, and I like the idea of only wrapping these in just paper towels, no foil, so they're ready to microwave as soon as you take them out of the freezer bag. The foil, however, might provide a little more protection against frost. With a pre-cooked rotisserie chicken and grains from the rice cooker, these burritos can be thrown together very quickly. Not only does it pack a nutritional punch with kale, broccoli and sweet potatoes, but this recipe has great, specific instructions on how to use freezer paper and tape to keep the burritos freezer-safe. For any of these recipes, check out TheKitchn's system for protecting wraps from freezer burn and reheating them. Does all this cooking, stuffing, wrapping and freezing sound like too much work? You can always fall back on the freezer aisle. This amusing post from From Away: Cooking and Eating in Maine compares 13 "sketchy" frozen burritos. The post also shares a bit of wisdom worth carrying over from store-bought frozen burritos to homemade ones: Although it's quicker to microwave them, baking a frozen burrito for about 30 minutes will have better, more even results. 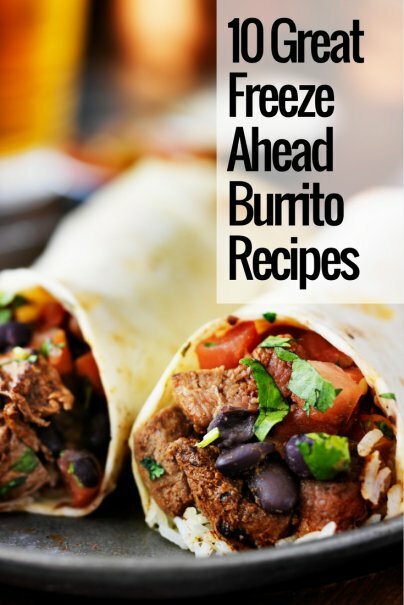 What's your favorite frozen burrito recipe? These recipes look really tasty, and as well as saving money, it is so convenient to pull something you made earlier out of the freezer, place in the microwave and on the plate 10 minutes later! I tend to make lots of chilli myself or variances with mince meet, it is so easy and spicy food always tastes more flavoursome after freezing! Does anyone know how long these burritos "keep" in the freezer?